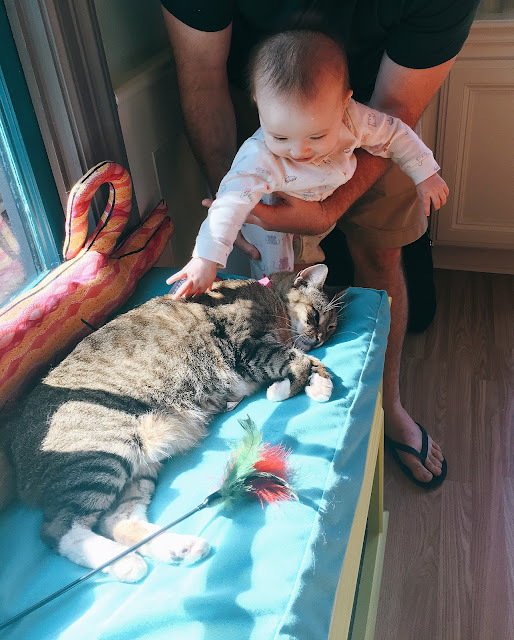 Houston opened its first cat cafe a few weeks ago and I couldn't wait to spend an afternoon hanging out with some kitties. Cat cafes started in Asia and are particularly popular in Japan. What are cat cafes, you ask? They are coffee houses that allow you to get caffeinated while hanging out with cats. They haven't caught on here in the states because of regulations against animals in restaurants, but El Gato Coffee House has created a space that separates the cat cottage from the coffee house. For $12 (lower rates for students and children), you get 50 minutes to spend time with 12 adoptable cats that come from the Houston Human Society. The cottage is a colorful, cat-centrically decorated space filled with cat bridges, cat trees and tunnels and even Cat Fancy magazines---basically cat heaven. El Gato even hosts events like yoga, movie nights and craft hour all with the cats. Some of the cats were a little shy but I managed to make new friends. Even Erin's baby daughter found a new furry friend.